Podiatrists are the type of doctor most qualified to diagnose your ankle sprain and help you recover quickly. Without proper care, a bad sprain can affect a patient’s ability to walk. This can drastically lower quality of life. These are usually minor injuries, but can also be quiet severe. Since ligaments connect the bones of the ankle together a bad ankle sprain can cause a joint to lose stability. When this happens surgery may become an option. Many people sprain the same ankle over and over because the ligaments have become weakened and stretched out. This can result in chronic joint pain, muscle weakness, and early onset arthritis. If you suspect that you’ve sprained an ankle, it’s best to see a podiatrist. These doctors specialize in foot care and many offer on-site X-rays and treatments designed to help you recover as quickly as possible. How does a doctor diagnose a sprained ankle? A sprained ankle is often diagnosed clinically, based on the symptoms a patient has and a thorough physical exam. The doctor will ask you how the injury happened and examine the foot, ankle, and lower leg. In all but the most mild cases it’s a good idea to have X-ray images taken of the injured ankle. This is to rule out hairline or twisting fractures which can occur along with the sprain..
X-ray images of the foot and ankle will be taken following your exam to rule out fractures. This is especially important. Fractures often occur with severe ankle sprains, and they may be difficult to detect hairline fractures. Your doctor will also grade your sprain on a 3-point scale. 1 indicates only very minor tearing, while 3 indicates a complete tear. What exactly is a sprained ankle? An ankle sprain happens when the ligaments holding the joint together are torn or stretched out. It’s an extremely common sports injury and can be quite painful. · Immediate pain and swelling. · Difficulty moving the ankle. · Pain when putting weight on the ankle. The primary symptoms of a sprained ankle are swelling and pain. With a severe ankle sprain (especially a high ankle sprain) the pain can be so bad that weight bearing is impossible. The injured ankle can also display bruising and is usually warm to the touch. Ankle sprains vary tremendously in severity. In minor cases no treatment is necessary and the problem resolves on its own. In the most severe cases the ligaments have torn completely and surgery is the only option. 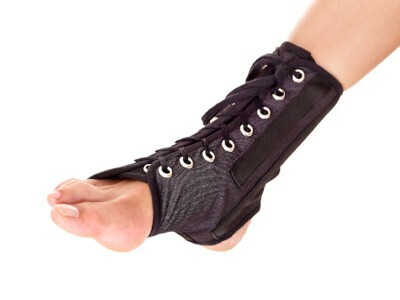 After a mild sprain the ankle will be tender and swollen, and will often feel stiff the next day. These mild sprains usually need no treatment beyond RICE (Rest, Ice, Compression, and Elevation). More severe sprains will show heavy bruising and joint instability, which happens when the ligaments which hold the ankle together are completely torn. In these cases the ankle can’t bear weight and the pain is severe. 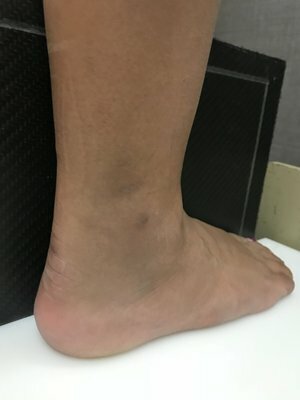 Pain when putting weight on the ankle. Ankle Sprains: Inversion and Eversion. · Eversion sprains—this happens when the ankle rolls inwards. The deltoid ligament on the inside of the ankle becomes stretched out or torn. · Inversion sprains—this happens when the ankle twists outwards. The ligaments on the side of the ankle become stretched out or torn. Of the two, inversion sprains are by more common by far. This is the traditional “rolled” ankle. The ankle can be divided into three sections: lateral (side), medial (inner), and high. All of these areas prone to sprain injuries. 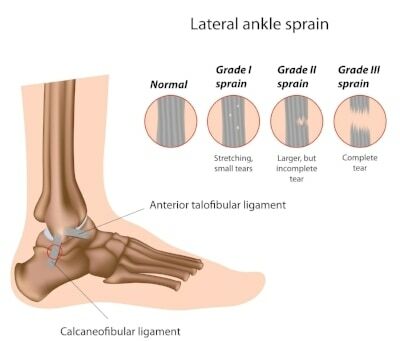 · Lateral ankle sprains occur most frequently. The ligaments preventing your foot from rolling inward are stretched or torn. · Medial ankle sprains aren’t as common. The ligaments preveitnign your foot from rolling outward are stretched or torn. · High ankle sprains are also referred to as “tib/fib” sprains. The ligaments which hold the two bones of the leg (tibia and fibula) are torn or stretched slightly above the actual ankle. This injury is more severe, and occurs when the lower leg and ankle forcefully twist away from the body. The Three Point Scale: Ankle Sprains Grade I, II, and III. Your podiatrist or orthopedist will likely grade your ankle on a 3-point scale. This is based on the amount of damage the ligaments in your ankle have sustained. Grade I (least severe): The ligaments have been over-stretched, but are not torn. The ankle will appear mildly swollen and may be moderately painful. You’ll probably feel stiff the next day. Grade II (mid-severity): Some or all of the ligaments have been partially torn. There is likely to be bruising, and the pain will be worse than with grade I. Often the patient can’t bear weight on the affected ankle. Grade III (most severe): In this cases some or all of the ligaments of the ankle have been torn completely. This is often accompanied by a popping or snapping sound, and the pain is immediate and severe. Severe bruising and swelling will occur. In grade III sprains it is extremely unlikely that the patient will be able to bear any weight on the injured ankle. Surgery is often necessary. · Wearing shoes which don’t support the ankle properly. A good example is wearing running shoes to play basketball. · Placing excessive stress on the ankle. This often occurs when walking or running on uneven surfaces. · Playing high impact sports with a lot of quick stopping, starting, jumping, and body contact. Two good examples are football and basketball. What can cause a sprained ankle? The vast majority of sprains occur when the body shifts rapidly over a planted foot. This can happen in contact sports like football and basketball. It also happens quite frequently when walking or running on uneven terrain. The most common type of ankle sprain is the “inversion” sprain. The ankle will roll away from the body and the foot will turn inward, damaging the ligaments on the outside of the ankle. This is the classic “rolled” ankle. Slightly less common is the opposite: the “eversion” sprain. This happens when the ankle rolls towards the body and the foot turns outward. In this case the ligaments on the inside of the ankle are damaged. The most common complication of ankle sprains are further sprains. When the ankle ligaments are stretched out or even torn, the joint loses stability and is likely to become injured again. It’s a self-perpetuating or “vicious” cycle. A bad ankle sprain might also cause a change in your gait. This can do many things, including causing hip and low back pain. When an ankle is sprained repeatedly negative long term effects can be seen. Chronic joint pain, muscle weakness, and wear and tear arthritis are common. Make an appointment with a podiatrist if you feel you’ve sprained an ankle. 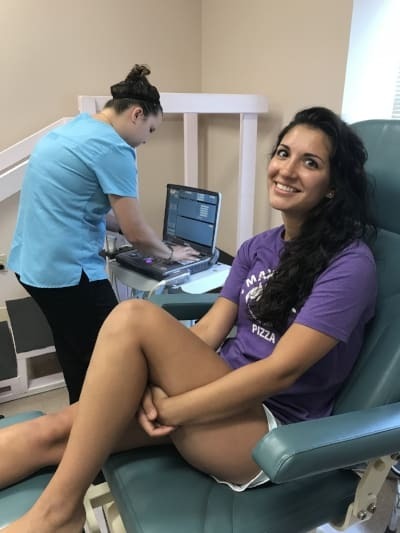 Dr. Christina Teimouri of the Beaver Valley Foot Clinic offers on-site X-rays and minimally invasive treatments to help you recover as soon as possible. Call us at (838) 313-3338 today. Same day appointments are often available. Ankle sprains are fairly straightforward. You’ll feel pain at the site of the ligament injury. The ankle will swell immediately, and bruising may be present. It hurts to move the joint, and the area is tender to the touch. When severe ankle sprains occur, it’s common to feel or hear something pop or snap as the ligaments tear. The pain is immediate and severe, and it’s often impossible to put any weight on the ankle, much less walk. As a general rule, the greater the pain and swelling the greater the healing time. In the most severe cases surgery is necessary to re-connect ligaments. R = REST the injured ankle. C = Apply COMPRESSION (air bracing, taping, or compression wrapping). E = ELEVATE the ankle. If the injury impairs your ability to walk you’ll probably need crutches. Supportive boots are used extensively. Traditional plaster casting is common as well. Non-Steroidal Anti-Inflammatory Drugs (NSAIDS) such as ibuprofen, naproxen sodium, and aspirin to control swelling and pain. Undergoing physical therapy to improve strength and overall function. This helps prevent further ankle sprains. Working with an athletic trainer or coach to develop proper technique to avoid injury. If you were injured playing a sport, make sure you’re wearing the correct footwear. An expert provider such as a podiatrist or sports medicine doctor can best treat your sprained ankle. They’ll not only get you back on the field but teach you how to avoid another injury. hat more severe sprains require professional care. When in doubt seek help from your podiatrist. 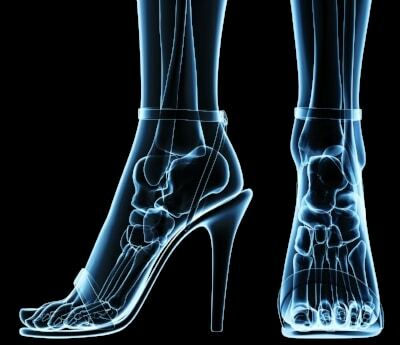 Many foot doctors (podiatrists) offer same day appointments and can take on-site X-rays. This is done to rule out a fracture. In most cases, they can provide treatments including protective boots and plaster casting on the first visit. Call the Beaver Valley Foot Clinic at (724) 772-FOOT (3668) to book your appointment.